The first Grand Tour of the year, the Giro d’Italia, was first held in 1909 to promote La Gazzetta dello Sport (which was printed on pink pages — the pink jersey’s not an accident). It comes after the success that the paper had after staging the Giro di Lombardia and Milan–San Remo, and was inspired by L’Auto‘s success after the Tour de France. On that first edition, the race was split into eight stages covering 2,448 km, so an average of 306km per day — ouch. This year, the 99th edition, there are 21 stages covering a greater overall distance of 3,467 km, but with a much more manageable 165km average per day. This year’s Grande Partenza will be held in Apeldoorn, Netherlands, with a short time trial followed by two flat, sprint-friendly stages before the race heads back over to Italy. There’s also a stop over in France in the final week. Overall, there are three individual time trial stages, three ‘mountainous’ stages (two of which are summit finishes), eight medium mountain stages and five flat stages. There are three rest days this year and the race is nearly 100km shorter than last year’s edition. We will be looking at the stages in detail each week and posting these on each of the rest days (or at least aiming to do so). For now, we will take a look at the main men who will be ‘fighting for pink’. He showed early promise for the year after taking the G.C. at the Tour of Oman in February, but a poor Giro del Trentino in March revealed he perhaps wasn’t in his top gear just yet. The cancellation of the Queen stage of Tirreno-Adriatico had him threatening to withdraw from the Giro (which ruffled some feathers amongst the peloton), but it seems he will be making the start in Holland this year. His Astana team is without last year’s 2nd and 3rd place finishers (Fabio Aru and Mikel Landa respectively — the latter’s now with Sky), but he still has a strong team with his lead support coming from Jakob Fuglsang and Michele Scarponi. Mr. Consistent has had a fantastic start to 2016 by taking a record fourth win at La Flèche Wallonne and taking the G.C. wins at Vuelta Castilla and Vuelta Andalucia. Amazingly, this will be his first participation at the Giro! And even though his only Grand Tour win came at the 2009 Vuelta, he will be one of the favourites this year. Betancur, Moreno and Visconti will be his lead support. After a being plagued by illness, Landa finally got his first season with Sky off to a start by taking the G.C. at the Giro Trentino and also a stage at Vuelta País Vasco. This will be his first Grand Tour as a leader and he’ll have Ian Boswell, Nicolas Roche, and David Lopez as his main support. His team will want to see him move up from his third place last year to justify his transfer as a replacement for Riche Porte. Another rider in a new team and one who is also coming into the race with good form, with strong showings at Catalunya and Romanie. Previously guilty of being the ‘nearly’ man, he’ll be hoping the many kilometres of time trial in this year’s race will work in his favour. Joe Dombrowski, Simon Clarke, and Davide Formolo make a a strong and multitalented support team. This could be his year for a podium or better. With a rather quiet 2016 thus far, including a mixed Romandie, Rafal will be hoping the form he hinted at in the mountains will improve just in time for the next three weeks. The young Australian Jay McCarthy is here for his first Grand Tour, so it will be interesting to observe his performance — he looks like he’ll be doing fine things in the future. 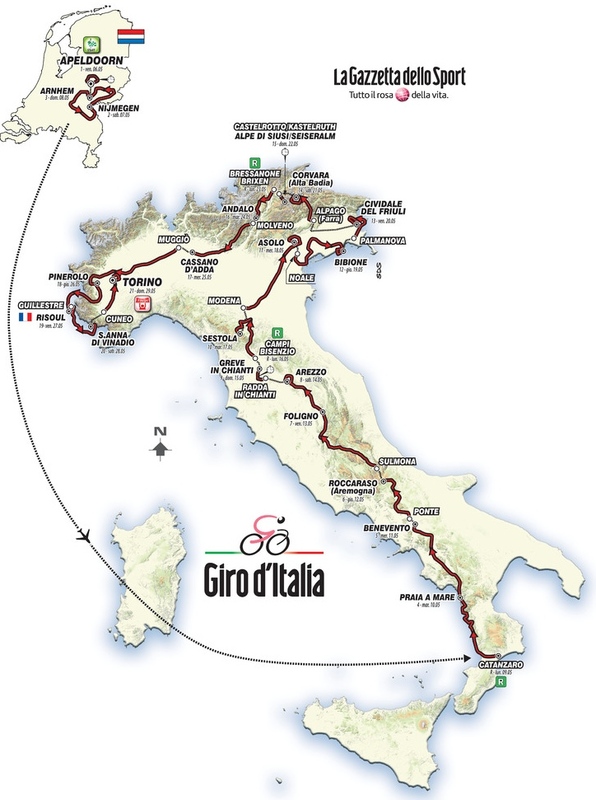 Another year, another Giro attempt by Pozzovivo. He will want to make amends after crashing out on Stage 3 last year, and after a strong Trentino he looks like he might be able to do so. However, the time trial won’t suit his lightweight skill set, and there are potentially better, more explosive climbers than him in the race. A top 10 finish would be a satisfying result. The smiling Colombian burst onto the scene last year with a decent outing in the Giro, before really making a name for himself at the Vuelta. He hasn’t raced much this year, and, when he has, he hasn’t set the world alight — though the cancelled Tirreno Adriatico stage robbed him of a good opportunity. The time trial stages won’t be great for him, so it’s likely this year’s Vuelta will be his main target, but he will have Damien Howson (winner of the Young rider’s jersey at last week’s Romandie), Ruben Plaza, and Amets Txurruka for support when the race gets to the mountains. Dumoulin was another Vuelta revelation, and also another rider who hasn’t had a great 2016 so far. Word is that he won’t be targeting the G.C., but going by his time trial performance at Romandie he will be the man to beat on the opening stage. It’ll be interesting to see how he fares up the steeper climbs later in the race, and we’ll get to see whether he’s got his climber’s legs back on. There were two standout stage wins from the Russian this year: out-sprinting Geraint Thomas on a mountain stage of Paris-Nice, and out-sprinting Nairo Quintana on a mountain stage of Romandie (though the latter win was taken from him by the judges due to dubious sprint tactics). He also managed 5th at a brutal Liège–Bastogne–Liège. His form is unquestionable coming into the Giro, and he must be considered a strong contender for the overall. Those are the main candidates for the win, but here are some outsiders of note: Stefan Kruijswijk, Ryder Hesjedal, Igor Anton, Sergey Firsanov and Bob Jungels. We won’t go into too much detail over the points jersey, but looking at the line-up of sprinters gives an idea of some mouth-watering match-ups for those flatter stages. We’re looking forward to seeing the grand tour veterans André Greipel and Marcel Kittel go head to head amongst the less experienced (but in no way less able) sprinters such as Caleb Ewan, Arnaud Démare and Sacha Modolo, to name but a few. Given that some teams are here solely for their sprinters, it seems unlikely that Elia Viviani will get the support from his Sky teammates to ensure he takes the red jersey overall, but he may still sneak a stage win. Matteo Pelucchi, Giacomo Nizzolo and Nikias Arndt will all feature in the final crucial kilometres of racing on the fast stages, but it will be a question of who has the legs to make it over the mountains; the eventual winner of the red jersey is going to have to have to held on across some tough stages. James picks Mikel Landa for the overall, reasoning that his training with Sky will have helped him to build upon last year’s excellent performance. And he picks Giacomo Nizzolo for the red jersey. For Italian sprinters, the entire season can easily centre around the Giro, and Nizzolo will throw himself full force into the sprint contest. Chris really wants to see Tom Dumoulin find some form and repeat last year’s Vuelta trick. With a lot of time trialling to be done, he stands a good chance at the podium if he’s in shape. For red, Chris picks the powerhouse, Marcel Kittel. Andy is picking Rigoberto Uran Uran, so good they named him twice. The time trials will be in his favour and, given the climbing powerhouses of Contador, Froome and Quintana aren’t in the mix, this could be Uran’s chance to grind a winning result out. As sprinters go, Andy thinks Sacha Modolo is in with a great chance, a fast Italian who will want to last the three weeks of his home Grand Tour, and he’s coming off some confidence boosting wins at the Tour of Turkey. Stay tuned for stage previews from us throughout the tour.